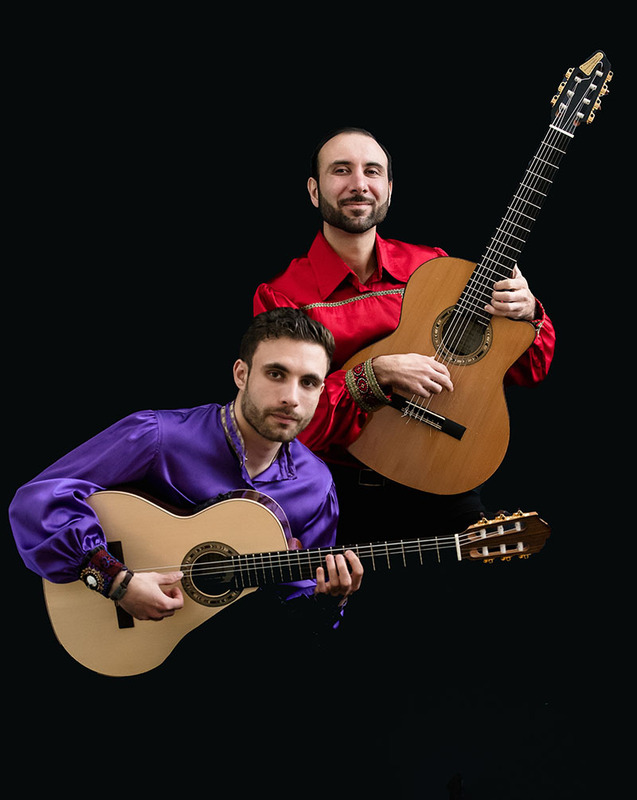 VS Guitar Duo is the The International project (USA/Russia) that is presenting Gypsy music, Jazz, Latin, Flamenco as well as popular music from around the world. VS Guitar Duo is a unique duet consisting of Vadim Kolpakov, famous seven-string guitarist and special guest artist of Madonna’s “Sticky & Sweet" World Tour, along with his nephew, virtuoso Sasha Kolpakov. 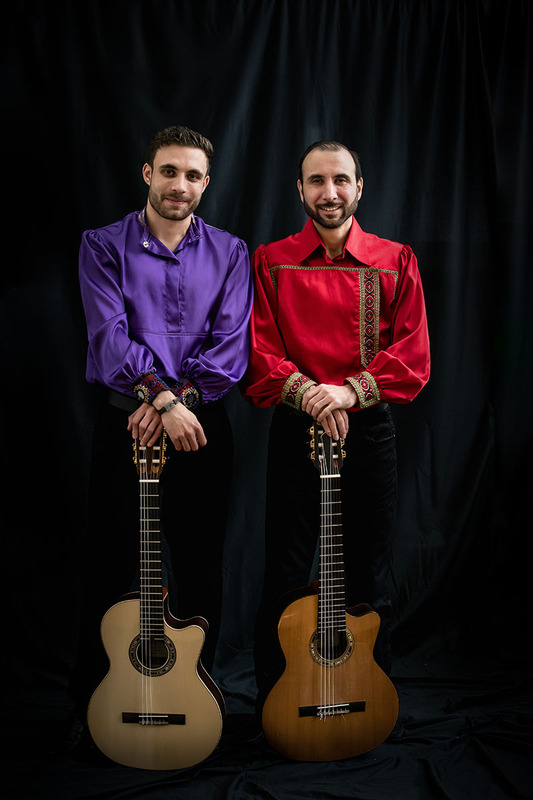 These two musicians continue the tradition of the famous Kolpakov family’s Russian-Gypsy artistic dynasty, which is already in the third generation. Vadim and Sasha Kolpakov unite music from different parts of the world and conquer the hearts of audiences with incendiary melodies and dances that originated centuries ago in the Romani camps of Russia and Europe. 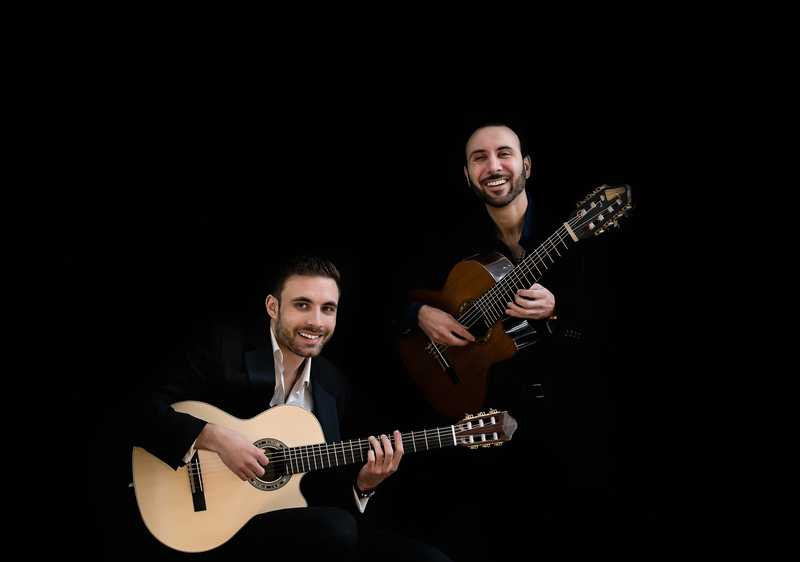 The VS Guitar Duo program combines music from different parts of the world, including Romani (Gypsy) music, American Jazz, Latin, and Spanish Flamenco. 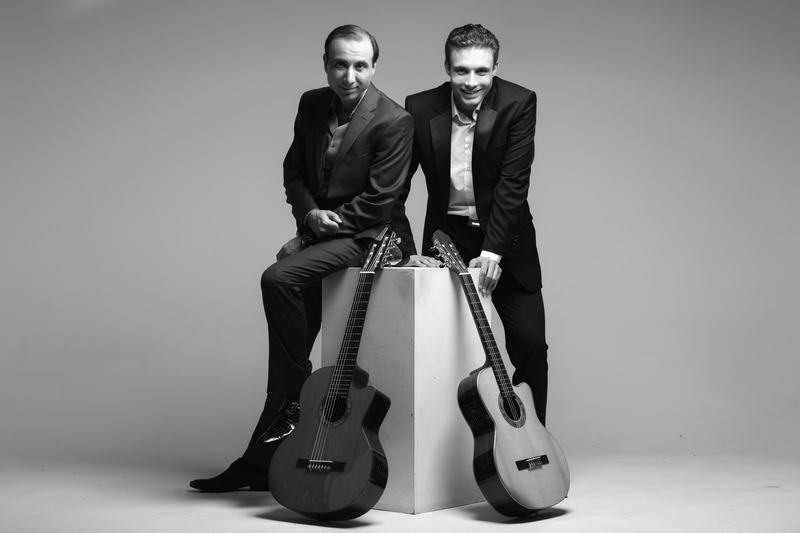 The VS Guitar Duo play concerts all over the world with invariable success. Their colorful performances delight spectators with a unique combination of Roma-Gypsy traditions and modern sound. They have performed extensively in the US, Canada, Europe, Russia and Singapore. The VS Guitar Duo always gets a great response and standing ovations. The musicians are permanent residents of the largest music festivals in the U.S., such as Tosco Music Party, Gypsy Fest Drom, and Iargus. They have collaborated with the Musical Connection production company and the Charlotte Ballet. The duo was invited as special guests for performances at international radio stations, including Radio VERA (Canada), The END Radio (USA), KBOO Community Radio (USA), and others. 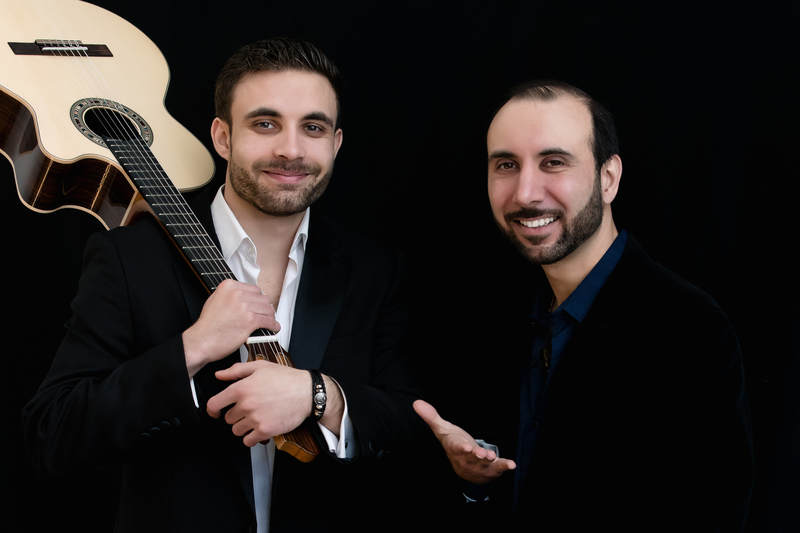 In March 2017, the VS Guitar Duo released a debut album titled "Under Cover," which collected the best world hits in their own interpretation. The CD sells with great success internationally. Vadim Kolpakov is a virtuoso Russian-Romany (Gypsy) seven-string guitarist, dancer, and vocalist. He has performed extensively in Russia and abroad, including at Carnegie Hall (NYC), Wembley Stadium (London), and the Kremlin. He has also participated in numerous musical projects on Russian, Canadian, and American television and radio. Since the mid-1990s, he has been a member of the Russian-Romany group The Kolpakov Trio, and in 2004 he assembled his own group in the United States, Via Romen. His musical repertoire includes 19th-century Russian seven-string guitar, and Gypsy, classical, rap, pop and world music. In 2008 and 2009, Vadim participated in Madonna’s “Sticky & Sweet” world tour as a part of The Kolpakov Trio. 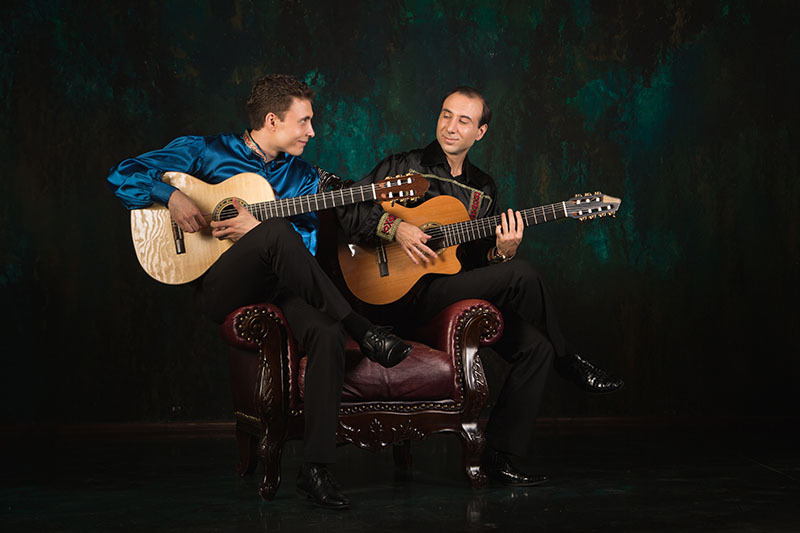 Sasha Kolpakov is a virtuoso guitarist of the famous Romani (Gypsy) artistic dynasty that has given the world three generations of exceptional musicians. He is the owner of numerous awards as a virtuoso guitar player at national and international music competitions. Sasha have been actively performing and competing both in Russia and abroad (Europe, Asia, USA, Canada). He performs with Via Romen US–based ensemble and in famous Ice show “Carmen” by Olympic Champion Ilya Averbukh. Repertoire of Sasha includes Romani (Gypsy) music, Latin American, Jazz and Spanish Flamenco. Similar to his uncle Vadim, Sasha represents Kremona Guitars.